After a franchise-long 17-day road trip, the Edmonton Oilers finally played their first game of the season on home ice on Thursday. And Oilers fans couldn’t have asked for a better finish. 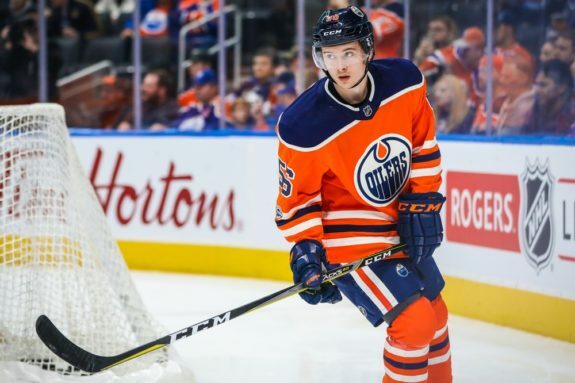 While they struggled early, rookie Kailer Yamamoto scored a beautiful goal in the second period (his first in the NHL) and Ryan Nugent-Hopkins tallied in the third before Leon Draisaitl finished things off in overtime on a scintillating play set up by Connor McDavid, giving the Oilers a 3-2 victory over the Boston Bruins at Rogers Place. It probably won’t stand up as the best game they play at Rogers Place this season (just one shot on goal in the first 12 minutes), but the Oilers defeated a Stanley Cup contender for the second time in three nights, and the home crowd was treated to some MaDavid magic in overtime. So, I consider it one of the most entertaining Oilers home openers I have ever seen. These are five other memorable Oilers home openers of the past 20 years. The game itself was unspectacular, but many fans will probably never forget that night. Prior to puck drop, the Oilers retired Wayne Gretzky’s legendary No. 99 jersey. Although I missed Gretzky’s prime years with the Oilers, I am thankfully old enough to remember his final three NHL seasons with the New York Rangers in the late 1990s. I will never forget watching my childhood hero wave to the fans at SkyReach Centre from the back of a Ford truck as it slowly drove around the ice surface in Edmonton that night. Gretzky was then joined by friends, family and former teammates at centre ice and presented with a painting of himself from his glory days entitled “Once and Oiler, always an Oiler” before raising his banner to the rafters of Northlands Coliseum (then Skyreach Centre). The Oilers have retired seven numbers in franchise history, but this ceremony was truly the greatest. 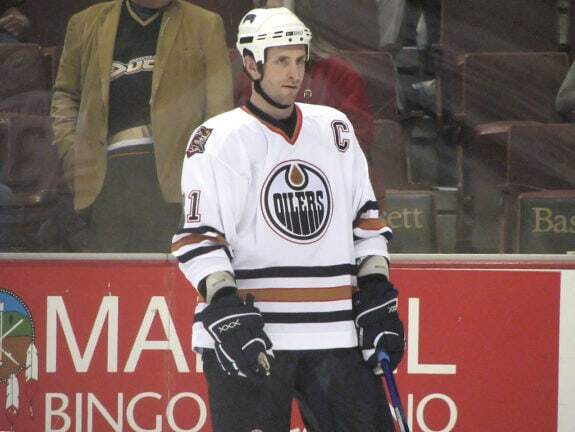 After the entire 2004-05 season was wiped out by the NHL lockout, the Oilers returned to action for the first time in 18 long months in October 2005. It was also the first game in an Oilers sweater for former Hart and Norris Trophy winner Chris Pronger, which made for a special night in Oil Country. It didn’t take long for the Oilers to get on the board. Shawn Horcoff struck just 24 seconds into the game, giving the copper and blue their first goal in 550 days. Then, tied four all in third period, Horcoff scored his second goal of the night with just over three minutes to play as the Oilers skated to a 5-4 victory at Rexall Place. Like the home opener in 1999, the final score wasn’t the biggest story. On that particular night, it was all about Gretzky’s jersey retirement. Six year later, it was about the city’s beloved Oilers being back on the ice. Following the worst season in Oilers history at the time, Oilers fans believed better days were in the horizon. It was the NHL debut of first-overall pick Taylor Hall; however, fellow rookie sensation Jordan Eberle stole the show. I was sitting at Chili’s in Calgary International Airport, surrounded by Flames fans, waiting for my flight home to Saskatoon. With the Oilers leading 1-0 early in third period, Eberle scored arguably the best first goal in NHL history. Jim Vandermeer picked up a lose puck behind the net in his own zone and made a nice touch pass off the board to spring Eberle and Shawn Horcoff on a shorthanded 2-on-1 rush. While it looked like Eberle would send the puck over to Horcoff for a shot, he showed exceptional hands and patience to toe drag around sprawling defender and go backhand top-shelf over Miikka Kiprusoff to make it 2-0. Eberle scored many highlight reel goals during his seven seasons in Edmonton, but none finer than his tally in his first Battle of Alberta. The Oilers crushed the Flames 4-0 that night, and enforcer Steve MacIntyre knocked out Raitis Ivanans late in the game, but it’s Eberle’s goal that we all remember. Related: What Happened to the Oilers 2008 Draft Picks? After years of negotiating, planning and constructing a brand new downtown arena, the incredible Rogers Place opened on Oct. 12, 2016. Earlier that day, the Oilers announced that Wayne Gretzky was joining the front office as Vice Chair of the Oilers Entertainment Group (OEG). The iconic bronzed statue of Gretzky lifting the Stanley Cup was also unveiled in its new home outside of Rogers Place. 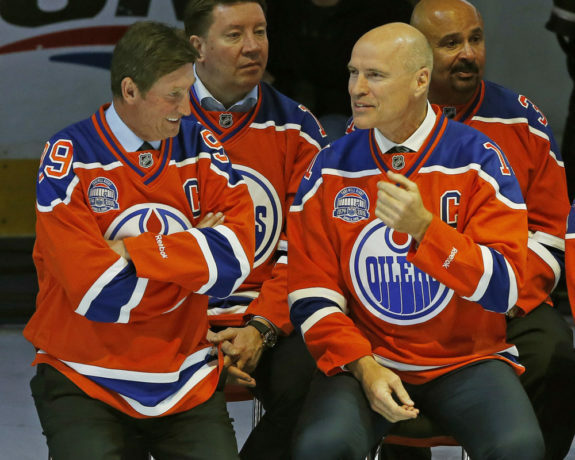 Prior to puck drop, Gretzky and Mark Messier skated out on to the ice dressed in classic Oilers threads and raised their sticks in appreciate of the fans for all their support through the glory years in Edmonton. Patrick Maroon scored the first-ever goal at Rogers Place a little over a minute into the game, which sent the sold out crowd into a frenzy. The Oilers scored multiple goals in each period, and McDavid, in his first game as team captain, had three points, including the game-winning goal on a penalty shot in the second frame to power Edmonton to a 7-4 win. The game was reminiscent of the Battle of Alberta in the 1980s; an abundance of goals, plenty of hard hits and a fight to ignite both sides all made for a great first night at Rogers Place. Watching the orange and blue beat their provincial rivals never gets old for Oilers fans. While the previous year’s home opener was a high-scoring affair, their first meeting in 2017 saw a systematic beatdown for the home team. At no point in the game was there any doubt the Oilers would be victorious. They were constantly in control, won almost every puck battle, created most of the scoring chances and received stellar goaltending. McDavid scored an opening-night hat trick, the first in franchise history, to lead the Oilers to a decisive 3-0 win on home ice.